The eco system for programming languages and frameworks is well evolved - and is continously evolving. As a web developer you are faced with many choices. I have tried to capture some of the options I had to evaluate for Apartment Adda. I have left out the esoteric languages and frameworks which have not become mainstream yet. This is the first decision a developer has to make and might be the easiest choice - pick the one where you have the most expertise. However if you are well versed in more than one language - pick the one that will suit your startup - based on the funds you have ( cheapest to host will be php to Java hosting being expensive) , speed at which you want to release ( php/rails being fastest to Java being the slowest ), team's expertise ( java developers being easy to find and ruby developers being hard to find ) etc. Framework Choices - Rails, ActiveRecord, CakePHP, Spring, Hibernate, Django..
Walden - I give up! 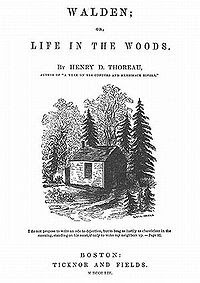 With much bravado I began reading Walden by Thoreau. After completing Zen and the Art of Motorcycle Maintenance, Ayn Rand's Fountain Head and Atlas Shrugged - I thought I can take on anything. I tried reading this book off and on for the last 3 months. During this time I finished reading a lot of books ( I read in parallel and have atleast 2 books that I keep alternating ) - but I never got beyond 20 pages of Walden. I can safely apply a quote of my friend, Akbar - "it is a lot of tedious nonsense" - he used it for the Zen and the art of motorcycle maintenance. Thoreau brags about his minimalistic life. But he has not seen the iPod, iPhone, Audi A4, Wii, Internet, Kulfi icecream and so many good things in life - why the heck will I let go off enjoying them or not work hard towards achieving these pleasures.